In the period immediately after the Second World War, several railway companies were considering long term plans for main-line motive power. In addition to the scheme to convert steam locomotives to oil firing due to the shortage of good quality coal, the idea of diesel - electric engines appealed to most railway boards. However, in 1946, the Great Western ordered a gas - turbine locomotive from Brown - Boveri of Switzerland and soon afterwards a rival from Metropolitan - Vickers in Britain. Both were delivered in 1950 numbered 18000 and 18100 respectively. The Brown - Boveri engine, nicknamed by the crews as 'Kerosene Castle', was rated at 2500 brake horse power whereas the 'Metrovick' had 3000 brake horse power. Neither engine was a great success since like all gas - turbine prime movers that operate at or near sea level, their high fuel consumption under part load conditions made them expensive to operate (the Metrovick's fuel consumption averaged 2.97 gallons per mile, roughly three times that of an equivalent diesel - electric engine). In addition, they were noisy and unpopular with the drivers. Both were withdrawn by 1960. 'Kerosene Castle' was returned to Switzerland where, after rebuilding, it was used as a mobile rail adhesion testing unit for the 'Union Internationale des Chemins de Fer' in Vienna and acquiring the rather more romantic name of 'Elisabella'. In the rebuilding, the turbine drive was replaced by an electric motor bogie from a French BB16500 locomotive, while power was fed to it from another SNCF locomotive which ran in tandem. 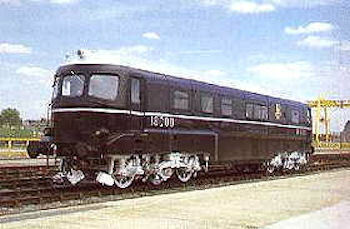 Number 18000 returned back to this country in 1995 where she is now displayed at The Railway Age, Crewe. Specifications of Brown - Boveri, number 18000.